There have been many lists about inbound marketing resources. This is mine. I actually use 99% of these inbound marketing resources on a weekly or daily basis. These tools make my job easier. The best part? Nearly all of them are free. Crayon is similar to Land-book, but instead of just landing pages, Crayon is a gallery for all all webpages. 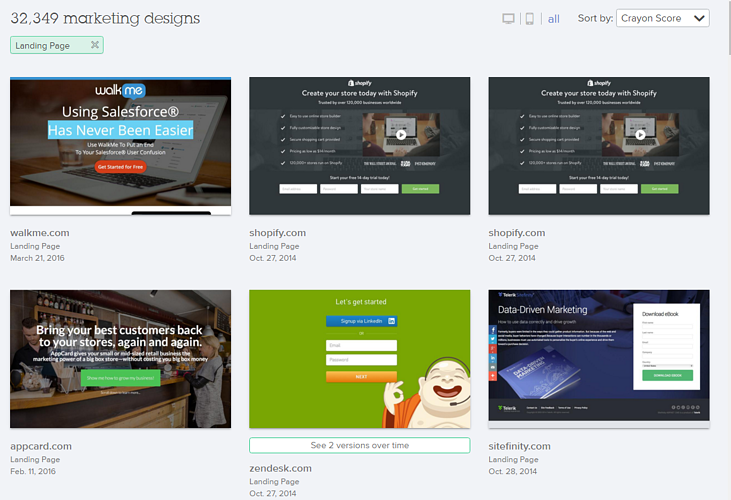 The site is organized by home pages, pricing pages, team pages, job pages, and more. Look for inspiration specific to your industry by searching your industy keywords in the search bar. Results for my niche industry (surety): a very impressive 2,297 results. My favorite part: Crayon provides multiple versions of the same page so you can see what a page looked like before it was updated. RGE is a giant collection of just what the name says: really good emails. RGE is constantly updated with emails sent through various Email Service Providers (such as MailChimp.) Search their email categories (my favorites are Abandoned Cart, Retention, and Survey) and get some ideas on how to liven up your automated emails. Ever wanted to insert a screenshot of your app/website into an iPhone, iPad, Macbook, or other device? Are you good at Photoshop? Awesome, you’ve probably succeeded in doing this. Placeit is for those of us who are not so awesome at Photoshop. 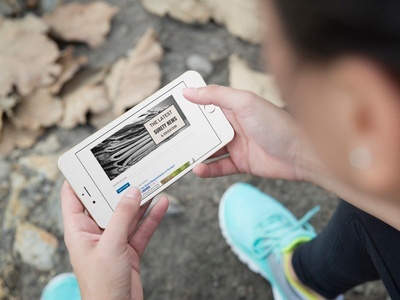 Just drag and drop your screenshot into one of thousands of free mockups and download. Instant image or video. I couldn’t make a resource list without mentioning Canva. Canva makes it amazingly simple to be a designer. Create web designs for social media, ads, your blog, or an ebook. Create print designs like documents, magazine pages, and marketing materials. Canva’s interface is all drag and drop, so there’s no learning curve. With the millions of free images, photo filters, and fonts there’s never an end to what you can create. Tip: Check out their design school for tips, tricks, and tutorials for how to create stunning web and print designs. Price: Free, except for special Canva images which are $1 each. Tip: If you like a layout, but it is a paid layout, just change the image in the layout and you can download for free. Not sure what font to use for your next design project? 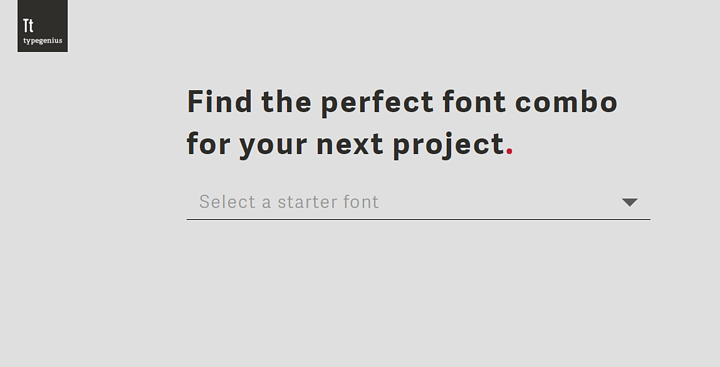 Head over to Typegenius, select a starter font, and then view font matches. Fonts are drawn from a curated collection of Google Fonts and Adobe Typekit selections. This is a great tool for getting started on the right foot. Let’s just say there are colors that work and colors that don’t. If you are looking for a color scheme (or even just a single color that will match your current brand) Coolors is the tool to use. Start the generator and find the perfect color scheme. Save, export, and view your color palettes later. Need a little help? At the bottom right of the screen is a tutorial button that will help you use the generator. Use them separately or use them together. I keep a giant list of title ideas on my desktop so I can add to the list easily. I love this tool. 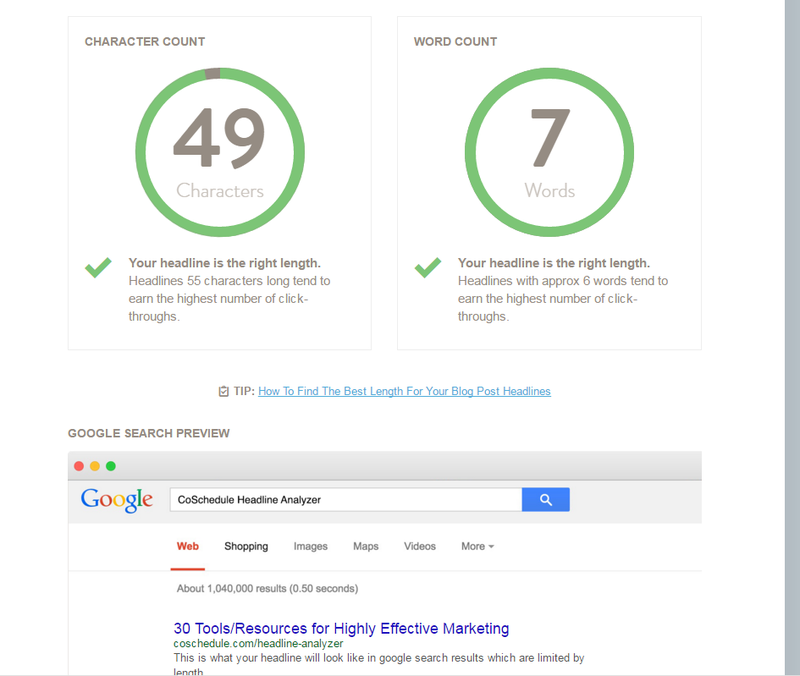 It not only grades my headline, it tells me the ‘why.’ It also gives a length analysis, word count analysis, and shows you how the title will look in Google search results and as an email subject line. Eliminate errors wherever you write: Gmail, Facebook, Twitter, Tumblr, LinkedIn, and essentially anywhere else you write on the web. Can be used with Outlook, Word, and Chrome via downloading free extensions (I have all three.) You can also copy and paste or upload directly to the Grammarly editor online. Grammarly corrects over 250 grammar rules such as common grammatical errors (there vs their), subject-verb agreement, article use, and general spelling mistakes. Correct your mistakes quickly with the click of a button. A curated list of the best articles to help you write better. Topics such as general writing, fiction, non-fiction, growth hacking, books, and online courses. What’s not to love? This won’t help with your grammar, but it might help with your writing. Coffitivity is a tool that generates white noise from coffee shop environments. Read the study on how white noise helps creative cognition. Price: Free (Morning Murmur, Lunchtime Lounge, University Undertones) or $9 for 3 extra premium tracks for one year. This is my favorite tool on this entire list. Zingtree is an online tool that you can use to create interactive decision trees for automatic support, training, FAQ pages, and more. Zingtree is easy to use and design. Once you finish making your decision tree, it is instantly turned into a short block of code that you can embed onto your website or blog. Best part: Users click through the Zingtree and can reach a final answer, go back, or restart, all without leaving the web page. We use Zingtree for common customer questions, such as how much a customer might pay for a bonded title in a certain state. Price: Free 30-day trial (highly recommend you give it a try for free) then monthly prices start at just $12. Create interactive images, maps, infographics, product catalogs, and more. Allow users to interact with your business or product by inserting clickable bubbles, buttons, or pins directly onto images. Thinglink is a great way to boost engagement while still remaining professional. The great part about the free and pro version ($8/month) is the unlimited views for your media. This is helpful for when you create something awesome and everyone starts viewing and clicking it. Price: Free 14-day trial. Monthly packages start at just $8. Want something more basic for your website or blog? Create a clickable map, customize with your brand’s colors, and lead customers where you want them to go. We use clickable maps for our blog so that readers can click on a state and read blog content specific to that state only. Could be useful if you have multiple office locations or branches and you want to offer a clean way to lead customers to a contact/info page. Simplify all your ideas, pages you view on the web, blog posts, to-do lists, and more all in one place. Later—whether that be days, weeks, or months—find something you saved by searching for a single word or searching via tag. My favorite part about Evernote is the Evernote Chrome browser extension. Whenever I come across a gem on the Internet, I clip it to Evernote. No more copy and pasting, no more saving, no more searching through poorly-labeled folders or piles of printed paper. Just one click to Evernote and it is organized and saved forever. 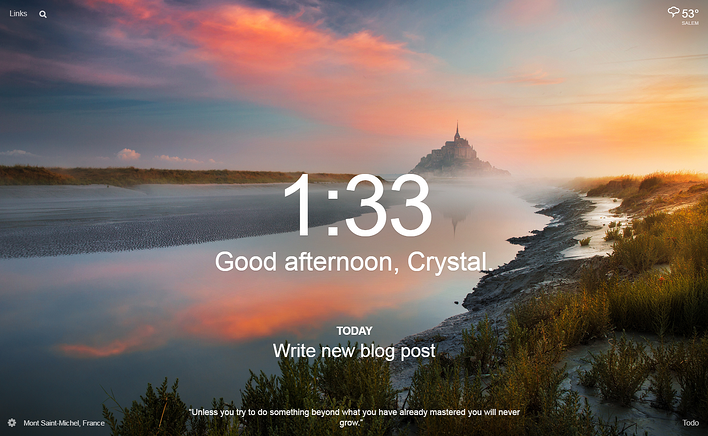 Momentum is a free Chrome browser extension that changes your New Tab to a Momentum tab: a beautiful image that changes daily, plus a reminder of your main task for the day so you can remain focused. The Momentum tab can also holds a smaller to-do list in the corner, weather, and an inspirational quote. I downloaded this for my browser last year and haven’t changed it back. Maybe I was born in the wrong generation, but there is something to say about plain sticky notes. Yes, those yellow little squares that people used before phones and computers. If I write something down on a sticky note, it sticks. Every day, I write down three things I want to do. Normally, they are not work related. Crossing a task off, even if it is not work related, feels awesome and might even make you a better marketer. Type in your URL and see how you score in performance, mobile, SEO, and security. Hubspot Marketing Grader makes it easy to see where your strengths and weaknesses are. Not sure why you should be improving a certain topic? 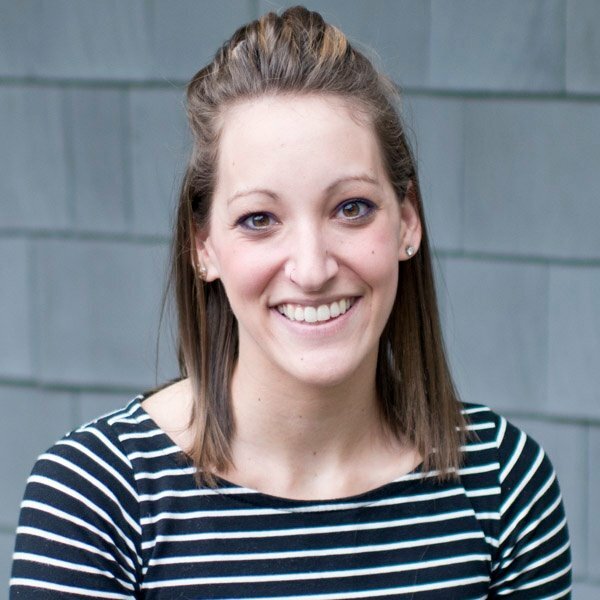 Hubspot Marketing Grader provides you with resources to learn more and learn why. Hotjar is a tool that collects user data so you can better understand how people are using and interacting on your site. Some of the opportunities available in Hotjar include heat maps, visitor recordings (such as scrolling, taping, and clicking), funnels that show which pages your visitors are abandoning your site most often, and more. Hotjar puts everything you need in one place so you don’t have to have multiple accounts and subscriptions from different companies. We use Hotjar to see how visitors are interacting with new pages so we know whether to edit those pages or start to duplicate them. Who doesn’t want to know how their competitors are doing? Search your competitor’s domain and see every place they’ve shown up in Google, every keyword they’ve bought on Adwords, every organic rank, and every ad variation in the last 9 years. Spyfu literally blows my mind. I especially like their kombat tool (pictured below) which shows shared organic keywords between your site and your top 2 competitors (or whichever competitors you choose.) 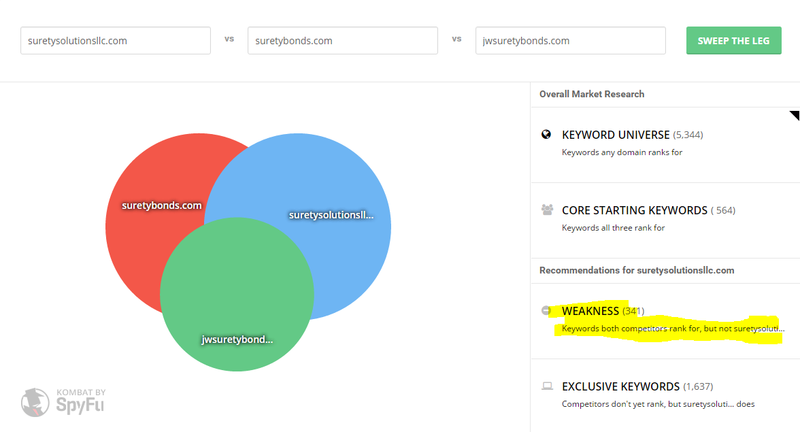 This is helpful in determing which keywords your competitors are ranking for, but you aren’t. Only downside is you have to pay for more data, but even the minimal free search gives you enough to get excited. Price: Unlimited free searches to get you excited. Basic monthly plans start at $49. Disclaimer: I do not use either of these…yet. I just found Delighted, a single-question survey that you can send to your customers and then receive their feedback on your dashboard in real time. Delighted uses the Net Promoter System to help you improve your customer satisfaction. Visit their site to see a demo of Delighted. Price: Monthly plans start at $25. Don’t want to send your customers an email? Why not try Wootric which measures your Net Promoter Score inside your web application. We are thinking of using Wootric on our purchase confirmation page to get instant feedback without hassling our customers. Visit their site to see a demo of Wootric. Price: Free forever, unless you want a longer window of feedback and follow up. Next plans up start at $89 a month. Continue finding more tools and resources at #26: The Freelance Stack. 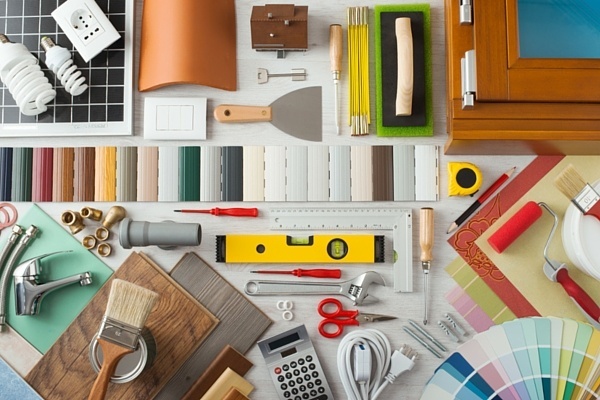 Browse hundreds of tools used by 15,000+ top freelancers. Find what you need. Be effective. Be awesome.